Normally I read Dresden books as paper books and I brought the paper version, but when it came down to reading it I was in the middle of the exams. I wasn’t up to reading anything more trying than Anita Blake books, so last week I bought the audiobook for one of my Audible credits and that seems to have been the perfect choice. A long train ride to and back from Copenhagen (to visit my sister) made for the perfect setting to listen to the majority of the book. Once I came home I found myself finding tasks I could do while listing. I have been captivated. 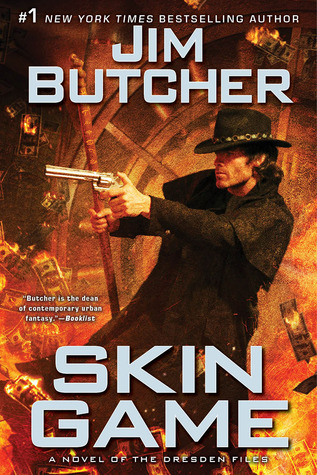 As far as I know this is to be the last book in The Dresden Files series. And in my opinion it makes for a satisfying ending. It is left open enough that Butcher can do more short stories in the setting both it isn’t leaving a ton of loose ends. I hope Butcher will decide to write some of Molly’s stories because I find her endlessly fascinating. Skin Game almost made me weep on the train ride – just before a job interview I might add – over a sword, nonetheless. It also made me smile and grin like a mad woman. It is a story filled with emotion. Jammed packed with action and plot and plots within plots. It is all about family, friends, hope and faith in the good fight. It is about fighting against all odds because that is the right thing to do. I found it to be a very satisfying read, one that made me want to go read Butcher’s other series Codex Alera (thought they are not on Audible *grumble*). The quality of Butchers writing is just wonderful. He is a master of first person narratives, of plotting and of pacing. The whole series is well worth your time and I might go reread it all later this year. The protagonist: Harry Dresden, white, straight, wizard, able-bodied.